City officials have seized control of a strip of waterfront land from a North Delaware Avenue industrial business for part of a planned bicycling and walking trail along the Delaware River from Fishtown to South Philadelphia. Through condemnation, Philadelphia authorities took title to an easement behind Henry Stewart Co., a wire rope business, between Marlborough and Shackamaxon Streets, city spokesman Paul Chrystie said Wednesday. 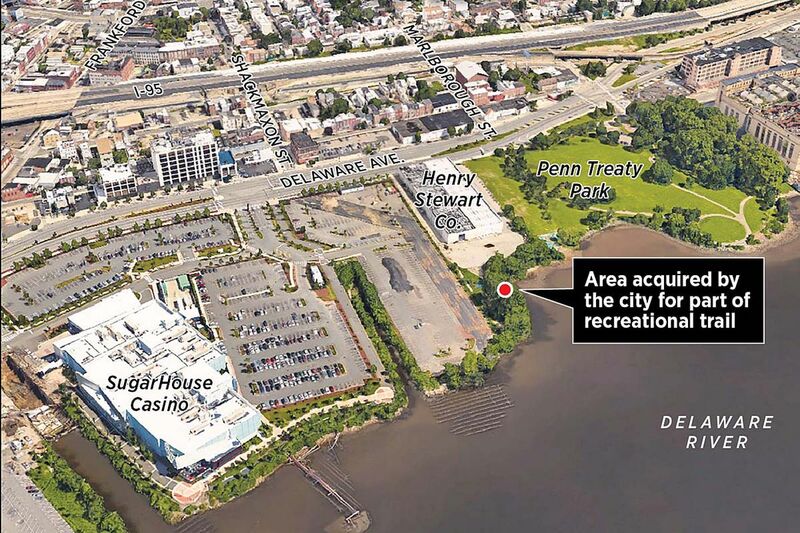 The acquisition puts an unbroken strip of riverside property connecting Penn Treaty Park with SugarHouse Casino under city control, Chrystie said. Assuming that the condemnation is not challenged in court, construction of the trail section can begin once the weather permits, he said. Henry Stewart Co. did not return a phone message seeking comment. The segment is part of a 3.3-mile trail planned by the Delaware River Waterfront Corp. that would extend from Penn Treaty Park, at East Columbia Avenue, to the north end of the Pier 70 shopping center at Tasker Street. Another segment of the trail, along the South Philadelphia property where a Foxwoods casino had once been planned, remains out of the city's hands. Waterfront corporation operations chief Joseph Forkin said his agency has not yet been able to negotiate an easement with the property's owner, developer Bart Blatstein. Blatstein's plans for the 21-acre site include a grocery store, a Wawa Inc. convenience store, and housing, according to a presentation posted to the website of Philadelphia brokerage MSC Retail, which is marketing space on the property. Blatstein declined to comment on the negotiations. Waterfront corporation officials have said they hope to acquire the easement with a $850,000 grant pledged by the state Department of Conservation and Natural Resources. DCNR spokesman Terry Brady said the award could be withdrawn if there were no deal by the end of this year. Last year, the waterfront agency used a separate $850,000 grant from the state to acquire an easement for the property directly north of Blatstein's. That property's owner, K4 LLC, has said it wants to build a complex of residential towers on its site.